This method overcomes the problems of low recovery, high bacterial content, sheared DNA, and excessive re-sampling costs common to most current non-invasive sample collection methods. iSWAB™ products are also bar-coded for traceability with matching bar code labels on collection tube side, cap and outside packaging. Suitable for manual or automated processing and easily adaptable to common automation platforms. The iSWAB DNA kit for humans can capture samples producing high yields of double stranded, long fragmented DNA from buccal cells using traditional swabs. Eliminates the need for swab transport due to patent design. 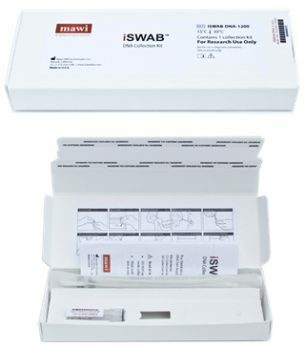 The iSWAB RNA device allows for the collection, concentration, and stabilization of RNA at the point of collection. Room temperature stable - reduce sample storage and transport costs. iSWAB-Blood is an efficient system for the concentration and long term room temperature stabilization of gDNA and analytes from blood drops. Scaleable and easy to process: manual and automation friendly sample processing. The iSWAB-Protein kit allows for high sensitivity of drugs in enzyme-based immunoassay detection. The MAWI lysis and stabilization buffer does not interfere with enzyme immunoassays based detection and allows for high sensitivity testing. Collect your DNA samples from animals with high yield <1% bacterial contamination. 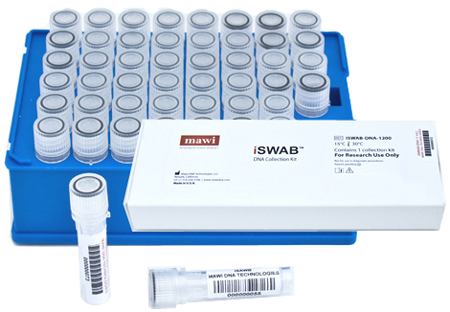 Reduce downstream failure rates for your animal genetics testing by using the iSWAB-VET collection kit. The iSWAB-ID system enables long term room temperature stabilization of the collected sample at the point of collection, while ensuring proper chain of custody. This system allows for maximizing sample recovery and obtaining human DNA compatible with ID profiling assays. Collected samples are stable over 5 years at room temperature storage.